Quiltville's Quips & Snips!! : All of those Talkin’ Turkeys, In All of the Colors! All of those Talkin’ Turkeys, In All of the Colors! It’s a mountain of scraps! This huge table of strippy stringy happiness has been a source of much delight for quilters on retreat with us in Ripley, West Virginia this week! Everyone was told to “bring stuff for the table – to take some, to leave some” and they did not disappoint! And routinely, I’ve found little gifties of fabric that folks thought I just “may need” such as West Virginia University blue and yellow prints to include a bit of West Virginia memories in upcoming projects. YES! And then of course we have the rivaling Ohio Red right across the river – must include some of that, too! Our workshop yesterday was Talkin’ Turkey from my book String Fling. Stringing blocks, trimming and slicing into triangles! Busy little strippy stitchers, all! What I love about teaching on retreat is the pace. The relaxed atmosphere. There is no hurry, no worry that you won’t finish enough in time before class is over at 4pm – class can go into the evening, and even into the late night hours if you are so included to sew into the wee smalls. We can spread the demos out, I can give more individual attention to those who need a bit of encouragement when it comes to trying something new be it a technique or a fabric placement that just might bring more life to a project. And if that isn’t enough – we’ve got a quilt shop in the corner! The Fabric Shop of Pomeroy, Ohio! I have had a blast with these ladies who are also sewing along with the retreaters, and when someone wants to purchase something, they come running with bells on. And I want your shirt! Great job, everyone!! FABULOUS blocks! They were still sewing away when I dropped out to head to bed by 9:30pm. I was whooped! It was a Talkin’ Turkey day to remember! And there has been much sewing on my part too! Today’s we’ve got more string piecing in store – Tulip Fields also from the String Fling book is next in line. Somehow I don’t think it will make a dent in the scraps on the table, but we are going to give it the old college try! My mystery quilts are hanging in a special display at the quilt show being put on by the Forsyth Piecers and Quilters. You can come see the fabulous show, visit the vendors and see my quilts up close and personal, quirky fabrics, mismatched seams and all! Gateway YWCA, 1300 South Main St. Winston-Salem. Saturday 9am -4pm Do not miss it! Vintage embroidered puss-in-the-corner summer spread found in Virginia. Amidst all of the "have-to's" in your path today, try to find some time to squeeze in some creative "want-to" that's been calling out to you! Don't you just want to climb in that pile of scraps! talkin' turkey is one of my fave bonnie patterns...beautiful blocks all! Talkin Turkey now on my to do list. Love ALL the color choices. What a pile of scraps looks like fun!!!!! `Love the mountain of scraps! Thanks to your tutelage, I have a great start to my own mountain! I appreciate that you take the time to share all of your classes and retreats. It makes me feel like I am there with you all and having fun! I already have a backing decorated with turkeys to go with the front whenever I can get started. That pile of scraps makes me want to jump in like a pile of leaves but scraps will last longer!! I’m only a little over an hour from Ripley. Wished I could have been there & love the shop in Pomroy. I will get to Quiltville Inn when it opens. The smiles on those faces say it all. Enjoyed seeing your quilts up close at the Winston Salem show yesterday. 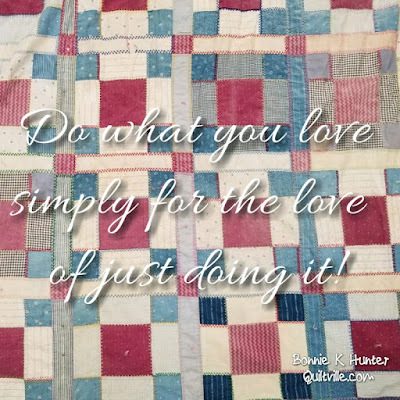 Until my husband saw them, he couldn't understand why I would work with small pieces of fabric rather than making quilts with my larger pieces more quickly. I make most of my quilt tops for a quilt ministry I started 10 years ago. We are still going strong!! Bonnie - Can you ask Liz where she got that adorable shirt with the volkswagon beetle and sewing machine on it?? Would really appreciate it! !